On any given Friday night in the summer, the traffic heading northbound on highway 400 is intense to say the least. I'm a little ashamed to admit it, but I delight in that bumper to bumper war zone. I'm not usually so apathetic, especially where traffic is concerned. I'm from the burbs so I'm at mercy to our clogged highways every time I want to leave my neighbourhood. I just can't seem to feel sorry for these lucky cottagers while I must swelter in the city, not a lake front property in sight. I'm waiting patiently for an invite from some kind soul who notices me gasping for air in the city smog, and in the mean time, I might as well shop for my future cottage getaway. For drinks on the deck you'll find me in some version of a comfy frock. I know cocktails at the cottage lack a dress code, but please understand you can take the girl outta the city, however, you can't take the girly out of the girl. I love the happy plaid of the Hippy Voile Halter Dress ($98) from French Connection, available at Sporting Life and would pair it with a wide brimmed floppy like the Linen Hampton from Big It Up ($45) to keep the sun out of my eyes. Shoes are a no brainer since flip flops are the official footwear of cottage country. If I'm not on the deck, I'm probably on the dock and my preference is a one-piece. You never know when a tube ride or water skiing opportunity might arise and which guest wants to be remembered for their wardrobe malfunction? I love the retro print on the Rittenhouse Paramount vintage swimsuit at Queen West's, Robber (sale $135) and am equally smitten with their custom printed Into The Fields denim tote ($30). Sure it's not waterproof, but it totally sets the stage for a carefree weekend. Toss in my sunnies, a great book and some UV protection and I'm set. Somewhere after the sun stroke and before the BBQ and bonfires, my style will definitely mellow out. Shorts and tanks will be thrown on without a second thought. Old Navy is so great for stocking up on those staples like the khaki shorts ($17) and coral cami ($8) a la cheap. In fact, they have a Stock Up Sale on right now so run, don't walk for the best sizes. This includes their flip flops at $3...check. Yes, simplicity reins but I can't resist a dash of fun via a great printed scarf like this Cotton Printed Birds scarf ($24.95) from Danforth area Drysdale & Co. I'm told the nights can get chilly up north and why should I be cold and less than cute? I'm sure there some more functional items that should find their way into my weekend bag, but this is a pretty stylish start. Now all I need is that special invitation. Just so you know, along with my ability to dress cottage casual, I also make a mean potato salad. 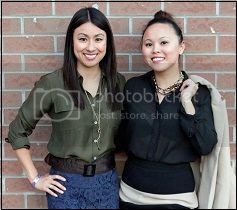 - Tamika Auwai is a fashion junkie, shopaholic, and founder of Shop Socials. Images via Sporting Life, Big it Up, Robber, Old Navy and Drysdale & Co.